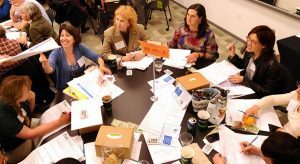 Across the U.S. and Canada, multi-stakeholder collaborative networks are addressing the systemic issues and wicked problems that cannot be solved by any one organization or institution alone. 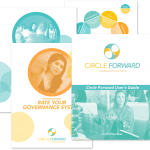 In the past 5 years here at Circle Forward, we’ve been working with these collaborative networks addressing regional food security, large scale landscape conservation, public health, economic and community development, and more. There are “circles” that maintain the strategy of the whole initiative, sometimes called a steering team, coordinating group, stewardship team, catalyst group, etc; and there are “circles” that take on specific strategies or projects, called working groups, teams, clusters, constellations, committees, etc. These circles often self-organize and have autonomy to set their own agendas, within the larger purpose of the network. A circle has a reason for existence, shared and consented to by all its team members. The team’s purpose supports the overall network’s purpose. This purpose and the values on which it is based must be codified in writing and accessible to members. Decisions are measured by how well they move the circle toward its purpose. There must be ways for the circle to access all the information it needs to make its decisions. This does not mean that all information is available to all people all the time, especially where there are clear reasons to maintain confidentiality. At the same time, having a default position of openness to share information builds trust. It supports more equitable access to the information needed to make decisions and greater engagement. A circle has a mind of its own. As such, circles should maintain short-and long-term memory systems. Typically these systems take the form of a collection of documents, meeting records, and written processes and instructions that are easy to retrieve and use. It includes clear descriptions of how the network operates and how to participate. Circle participants link and work with each other, other circles, and the wider network. They need platforms for sharing information and communicating like those described in the Network Weaver’s Communication Ecosystem free download. And they need systems of support that promote access and equity of participation. 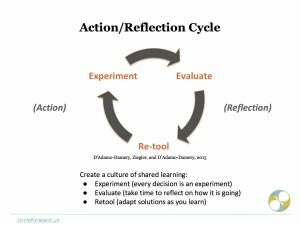 It includes structures for assessing, measuring, learning and responding to feedback. Feedback must especially be sought from people on the margins to sustain a culture of consent. As Steven Covey observed, success in collaboration moves at the speed of Trust. Trust is built in collaborative networks when members make space for difficulty, such as interpersonal or inner conflict. They get really good at giving and receiving feedback, to be accountable to each other. Trust has a chance to develop when people accept their blind spots and listen to each other’s viewpoints. Healthy circles are social places where joy, laughter, and energy are signs of the work moving forward. “Nothing about me without me” needs to become standard operating procedure; in other words, people have a voice in decisions that affect them. Success in systems-level change depends on authentic participation from all parts of the system. Across race, gender, class and other differences, healthy circles learn about how cultural and historical contexts affect people. They seek to realize the highest potential in each individual. Consent-based processes give people a range of tools to operationalize equity and make wiser decisions. Collaborative networks form because problems are wickedly complex. Healthy circles within these networks are willing to explore the complexity of the issues. They support leaders who say “I don’t know,” and are willing to enter realms of uncertainty with curiosity. They make space for different ways of knowing and honor intuition. They see the world as deeply interconnected, asking what’s really going on here; how does a small problem perhaps reflect systemic issues? They discover elegant solutions that emerge from the context. Given the constantly dynamic nature of networked organizations, circles need a great deal of flexibility in relation to their environment. To respond effectively, collaborative teams must develop continuously. Development means learning, teaching, and researching in interaction with the common purpose. It means being open to change, including personal change, as a result of what we learn and experience. As part of their development, circles need to think about succession. They need processes to add and remove members and processes to easily assemble and disassemble their circles.